The Antidyn Files: Kim Jong Un, go to hell. Kim Jong Un, go to hell. This comic is about the controversy surrounding “The Interview”. At first, I cared nothing about this controversy, to be honest. I am unsure why, maybe it is a dislike of Sony, or the fact that this movie looks stupid to me. I don't know. I couldn't get myself too worked up about it. However, I talked about this incident with a friend, a good friend who is actually very conservative. He and I only agree on about three issues. Anyway, in talking to him, I began to realize some of my hypocrisy in not caring about this issue. I was furious when Comedy Central would not let South Park depict the prophet Muhammad. I like Freedom of Speech. More than that, coming of age during the Post 9/11 age, I have always been disappointed when the United States surrenders its values in the face of fear. I don't think seeing “The Interview” should be held up as a patriotic duty. It isn't volunteering to help this country or fighting for freedom overseas. I do feel patriotic to an extant, but I think that American Exceptionalism ventures into the territory of Nationalism and Xenophobia. Regardless, preventing artists from expressing a viewpoint using threats of harm, as the Guardians of the Peace did, is wrong. While I don't like some of the ignorant ways, and yes, even racist ways, some Americans talk about North Korea, it does not change the fact that the Kim Jong Un regime is repugnant. They are guilty of war crimes on par with Nazi Germany. That has nothing to do with how I feel towards the arrogance of the United States in world affairs or some of its moral failings. Moral failings which pale in comparison to those of North Korea. I think that opposing this kind of terrorism isn't liberal or conservative. It's American. More than that, it is human. While the United States got the ball rolling, freedom of speech is a human right, and a human virtue. 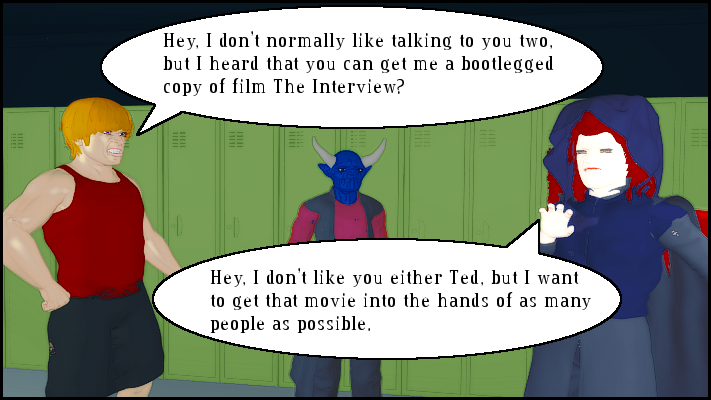 I had to modify this comic once Sony decided to release the Interview. Below is an image of the first panel as it originally existed. Happy holidays, everyone.